Two sisters. Two cities. One dog. Two cats. And lots and lots of yarn. I started these socks on my trip to Lexington to see the Yarn Harlot last month. Unfortunately, I had to rip out the several inches I completed during her talk because of an error in the book's chart. (Note to self: check for errata before starting a project!) But I persevered and ended up with these great socks...just in time for summer. Oh well; they'll be great to wear next fall. Once I corrected my chart, I found it an easy repeat to memorize. I ended up doing 1.5 repeats of the chart on the bigger needles and then switching to the smaller. Even using smaller needles than the pattern calls for, I still ended up with plenty of room for my fat calves. I do really like this yarn. I'm sorry it's been discontinued, but I would certainly try other yarn in the MadelineTosh line. 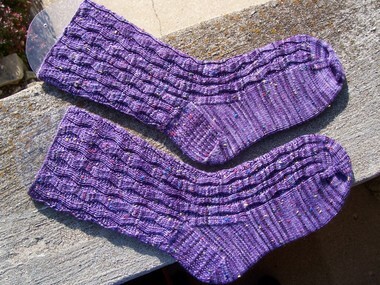 And though I'm neither a little bit country nor a little bit rock 'n' roll, I will love wearing my purple socks. I love the purple socks! Can't imagine having to go out and buy sonething to go with them but they are neat!! The pattern is so upscale from my 1-2 1-2 --maybe I need to rethink and go out and buy something interesting--no-msybe black and white will do --purple/black/white--sounds good!